You're planning a climb. And the question before you is: what should we carry along for protection? If you're in an established climbing area, no problem. A guidebook will often tell what you need to know before deciding what to carry: type of rock, width of cracks, amount of fixed or natural protection, length and direction of each pitch, difficulty rating—even the precise sizes of chocks needed. Fig 10-48. 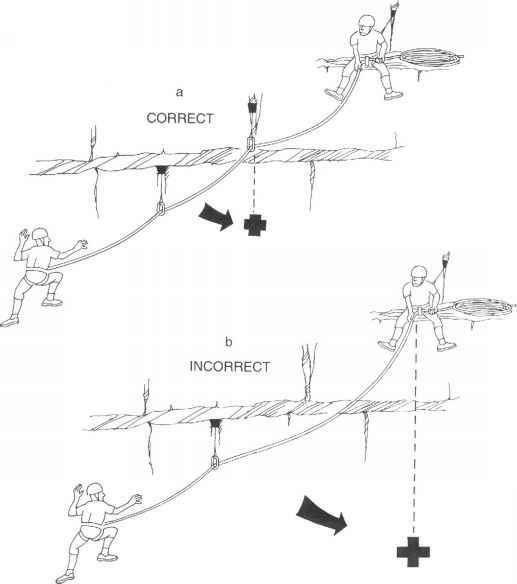 Protecting a traverse: a, correct, placing protection after a hard move on a traverse can reduce the potential pendulum fall for the second climber; b, incorrect, if the second climber falls on < traverse with inadequate protection, he faces a long pendulum fall. less information to use in estimating what to take along. Take too much, and the extra weight and equipment make the climbing awkward and harder than necessary. Take too little, and you may be forced to "run it out"—to climb higher above the protection than is safe. For protection, a leader always packs a selection of chocks, earabiners, and runners. But how many and what kind? These questions can't be answered without knowing some specifics of the climb at hand. However, there are some general considerations in choosing what to bring. First of all, there's an endless variety of protection available—in the climbing shops. Because of the cost, most climbers own only a moderate number of protection devices. So the two climbers in a typical rock climbing team can really choose only from the protection they own (or borrow). The climbers usually combine their equipment to increase the choices of protection. Chocks: It's very difficult to know just what size you'll need. Pick sizes and types that fit a wide range and offer more options. Carabiners: In most cases, each protection placement requires at least two carabiners. Nonlocking earabiners are the norm, though locking carabiners can be used in cases where the gate might be forced open during a fall. Many climbers carry extra carabiners (free carabiners) for contingencies. Runners: These will be in three lengths: short (quick draws), medium (single runners), and long (double runners). Each point of protection commonly requires one runner. The proper runner at any point is the one that helps the rope stay in as straight a line as possible. 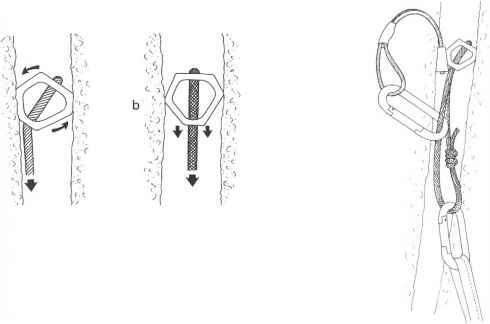 Additional runners are needed for belay anchors and unanticipated protection placements.